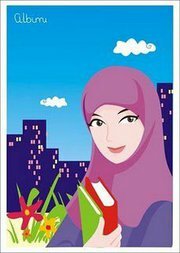 The Hijab – What is the correct Hijab of a Muslim woman? Why should we wear it and how should we wear it? What is the correct Hijab of a Muslim woman? Why should we wear it and how should we wear it? The reason for women to cover is clearly stated here by Allah the Almighty as a form of protection. And in the following verse from the Quran it is clear who women are allowed to be uncovered around. The Jilbab is defined as the covering with which a woman wraps around her body on top of her regular household garments to cover herself from head to toe, and is intended to completely hide the shape of her body. The Jilbab has been mentioned in ayah 33:59 above. This ayah orders Muslim women to draw their outer garments about themselves when they go out. Umm Salamah narrated that: When the verse, “That they should draw their over garments (Jalabib) close around them” was revealed, the women of Ansar came out as if they had crows over their heads by wearing over garments (Jalabib). Hence, the Khimar must fully cover not only the hair, but the neck, the shoulders and the chest. The women in the time of Jahiliyyah (ignorance) wore anklets which were used to attract attention by stamping their feet and making the anklets jingle. This shows not only that this practice (of stamping the feet to draw attention), is forbidden by Allah, but also that the legs and ankles must be covered as well. So it is clear that the dress worn in public must cover the entire body (including the feet) except what has been specifically excluded. Therefore, from the above proofs from the Quran, the Sunnah and the Statements of the Salaf of this Ummah, we can conclude that a Jilbab or an outer garment or cloak of some type must be worn by a Muslim woman over her normal clothes whenever she goes out in public or if she is in the presence of strangers (i.e., men that are not a Mahram for her) within her own home or the home of a close relative and that simply covering the hair with a headscarf along with normal clothing is not sufficient. Garments such as the Abaya, the chador, a cloak or other similar garments that are worn over normal clothing can also be defined as a “Jilbab” as well as any combination of clothing that covers as a single over garment (such as the Abaya) does. The Jilbab should be thick and opaque so as not to display the skin color and loose enough so as not to reveal the shape and size of the woman’s body beneath it. The Scholars have interpreted the Prophet’s (Peace be upon him) statement “although clothed, are yet naked” as meaning a woman wearing clothes that do not cover her body properly.